Home > Go Kart Parts > Go Kart Brakes and Accessories > Full Union Brass Fitting, 3/16'' tube to 3/16'' tube N.P.T. 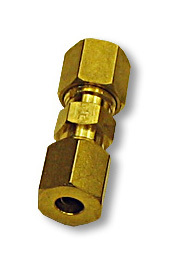 This is a full union brass fitting, 3/16" tube to 3/16" N.P.T. for hydraulic brakes and hydraulic brake lines.